Riding the ACA Chicago-NY Bicyle Route. After a great catch up visit with Anthony in Columbus–which included driving around a really nice city looking for hot chocolate and bike shops–I hit the road once again. The end is in sight, and that is both motivating and frustrating, It is a mad dash to Wheeling, West Virginia. From there on it is almost entirely trails down to DC and victory. Getting there though has me riding a squirrelly network of state roads through lovely increasingly hilly eastern Ohio. The good news: there are views and small pretty hilly farms. The neutral news: hills are back. The undoubtedly bad news: pickup trucks. Each in order. Views. After so much flat it is interesting to suddenly have horizons that lift up and assert themselves. There are few farms, that industry having moved away from here long ago. But there are lots of low tree-clad hills and it is a nice change for the eyes. Hills. Most people would say “rolling” or “gentle.” That is fair enough, but then again most people are not riding them. These being small state roads, they rise and fall more or less as the ground does. Big highways carve their way through elevation changes they don’t like. I remember being a kid on family trips on New York’s interstate system and being really fascinated by the huge cuts Eisenhower’s navvies blasted, bulldozed, picked, and chewed through the “rolling” hills north of the big city left isolated by the ridiculously conceptialized paved spider web. But few states and no counties have the money to level their roads’ paths, and so they rise and fall as does the land itself. What planners can do though, is seek out the easiest passes over the hills. 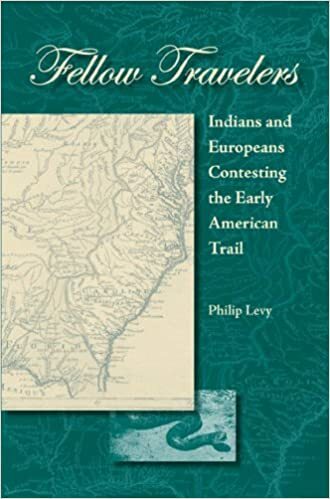 Of course the planners have had some of that work done for them already–first by the Native peoples who figured out all the good routes, and then by the colonial come-alongs who appropriated that network and massively expanded it. Eventually the roads were widened and later paved and graced with a charming array of numbers and occasionally stupid names. The steeper the grade on a road though, the less likely it is to have had Native origins. These were not stupid people–and despite some colossally inflated population numbers one hears from time to time–they were also not that numerous. A few million north of Mexico by the time Europeans arrived. That meant that their main paths were few and generally went the easy way, along river runs and seeking out the passes. So, every time I have to crawl up a 10% grade road or worse, I am suffering on a fairly recent path made viable only by the advent of non-human propulsion. The ACA reputedly seeks out the roads that score best on having low traffic, gentle grades, and good shoulders. Some score better than others. 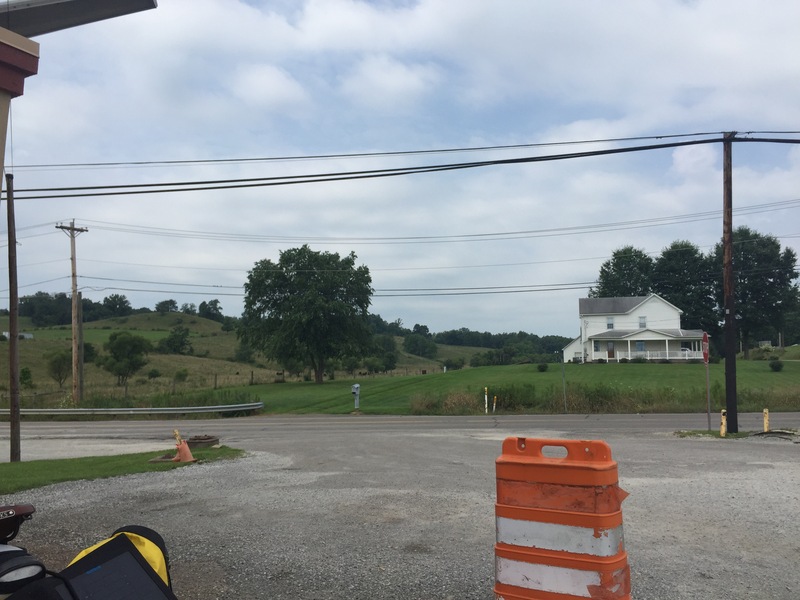 The route into and out of Zanesville has scored poorly on all three metrics, The hills are steep, but in truth they are not that long and actually are pretty fun to take on–even for a terrible climber such as your humble. The shoulders have been a mixed bag though. When they are there, they are a bit narrow and too often covered in inhibiting matter. This is a huge problem on the steep downhills which can rev one up to 40 mph. 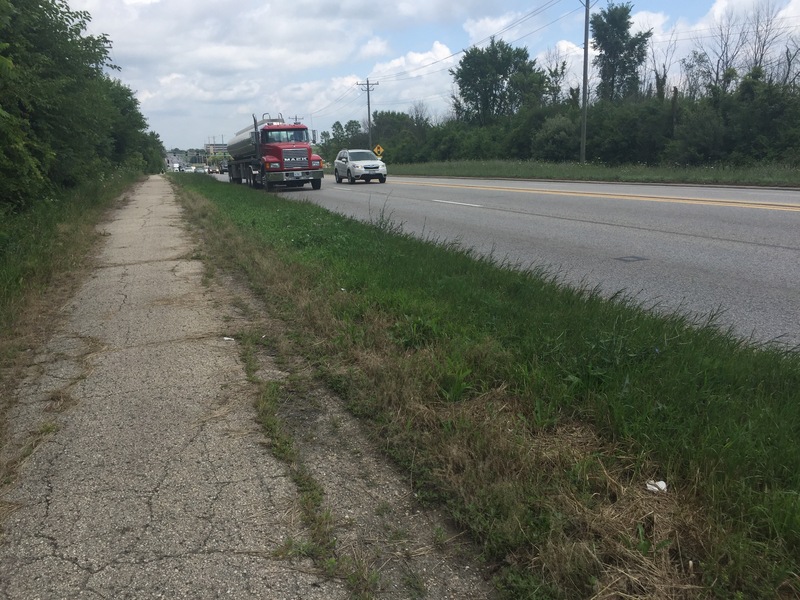 One time I had to rather suddenly stop thanks to a mass of gravel that had been dumped on the shoulder covering a length of easily ten feet. Even when a shoulder is not serving as an impromptu gravel storage patch, it is often deeply cracked, glass covered, or trailing off unevenly as if the road crews just got bored and walked away before the job was done. The third metric is traffic and so, Cars: Have I mentioned that I hate them? I know they are needed–our at least they are for now–and I do make use of them myself. But we have far too many and for too many terribly irresponsible people driving them. I know nothing is going to get better for some time to come, but I can dream. When you cycle, you get to see up close all the terrible habits of the modern clueless driver. Texting, running stop signs, tailgating, trying to pass a dump truck on an incline on a narrow road, cutting corners so that you drive on the shoulder, adorning their conveyance with all manner of idiotic images (skulls are very popular in this part of the world), and more, all dance and swirl before me at corners or on the occasional shoulder. The terrain here deamads that the ACA select roads that are a bit busy–there seems to be no other choice, and a detour today thanks to a closed bridge showed me that the non-ACA roads are worse. Riding into Zanesville yesterday at about 4:30, I stopped at a store to wait until about 6:30 when most of the cars had stopped zooming by. They come in pulses–five and six cars strung together. This is because the pace is set by the first car in the line and the others are pressing in close behind waiting to seize their chance to pass. I blame NASCAR. Too many of these people have exactly the wrong images in mind as they drive home from work or stop for 12 packs of beer at a road side convince. I say cars, but really it seems that most of the vehicles here are pickup trucks. And not just shining new suburbanite Silvarodos–these are beefy loaded monsters. Some have big flat platforms on the back instead of shiney new beds. Others are loaded with specialized boxes. Still other cart trailers with lawn mowers or other gassy things in tow. Some of those trailers can be twice as long as the truck itself and make for scary passing. Watching these trucks it seems that the whole economy here is about maintaining what exists. One guy repairs a house for a dollar which he hands to a guy who mows his lawn, who then hands it to the guy who does home visit pet grooming, who hands it to the guy who fixes his toilet, who hands it back to the first guy who builds him a new garage for his extra large pickup truck. It is not the worst model for an economy all in all–at least it is at some level sustainable. They all share a few things as drivers though. They are all completely unaware that one can actually slow down on a road–these are people who see speed limits as a challenge and not a safety measure. They are also convinced that their own masculinity is somehow connected to the speed and noise their vehicles can produce. They also hate cyclists. They blast their horns, cut close, pull out onto the road before they turn so that they can block your descent or force you into traffic, yell insults, and take an almost visible joy in imperiling others. So this is what I deal with–or at least what I have to deal with unti l I get to Wheeling. a storm formed at about 2pm. As I passed through a small crossroad town, I spied a large and friendly looking pavilion in a park of sorts. I decided to wait out the impending rain here. Rain is my foe, and I really have no intention of adding water to the problems already inherent in riding these shoulders. My pavilion has picnic tables, electrical outlets, and a porta-san. It has a spigot but it is dry and there is no phone signal. I took a nap and the rain came. I ate a bit after waking and a second round of rain came in. By 4pm I came to realize that I was sort of stuck here for the night since the world was now wet and my maps showed nowhere close worth the effort. I thought about going to the store about three miles away in Quaker City but it started raining again as the idea formed. No Wheeling today as I had hoped. That will happen tomorrow–and maybe it will have to be the Saturday layover spot. The way forward has many towns, but no places to stay–nothing until about 30 miles south on the GAP. Tonight I will sleep on a picnic table–no cycling tour is complete until one has slept on a picnic table (my nap does not count). Up at 5 through and done with roads by noon! Ya’alla! 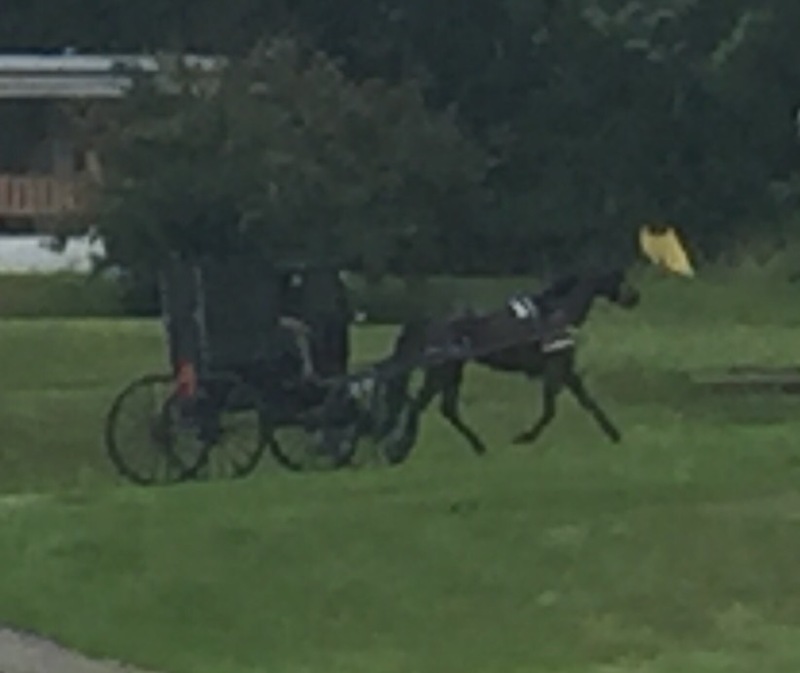 Now and then comes the distinctive clip clop of an Amish buggy. I saw plenty of human Amish varieties at the convenience yesterday during my rush hour sheltering. Most were young guys packed into pickup trucks coming home from construction jobs. The Ohio Amish are a bit different from the more fetishized Lancaster churches. The Pennsylvania people survive on an eastern urban desire for organic vegitables. The Ohio people though took up dairying ages ago and so their family farm economies were obliterated by mechinaized massive agri-business. Their choice was simple–hold the old order line barring modern technology and lose the community, or, adapt and survive. They adapted, and now lots of guys with the distinctive thatch haircuts and those curious green or blue button down shirts pour into convenice stores to grab a quick corn dog and a Snapple before getting driven back to homes that usually lack the technology they use on the job. Many would see this sort of accommodation as just so much stupidity. Not me though–I love it. The brilliance of Jewish legal thought is exactly this kind of careful as deliberative accommodation, and I am glad to see others working the same sorts of levers. Man Plans, God Laughs Tour, 2017. Richmond, Indiana. Rain. 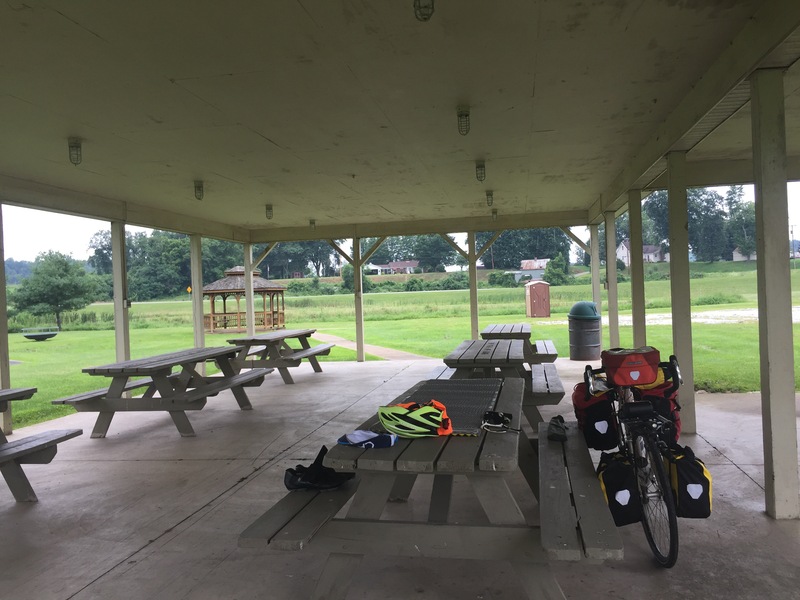 I sit under a picnic shelter on the Cardinal Greenway just outside of Muncie, Indiana. Had I thought more clearly about the rain, I could be sitting in a Starbucks in town and would be a mite more comfortable. 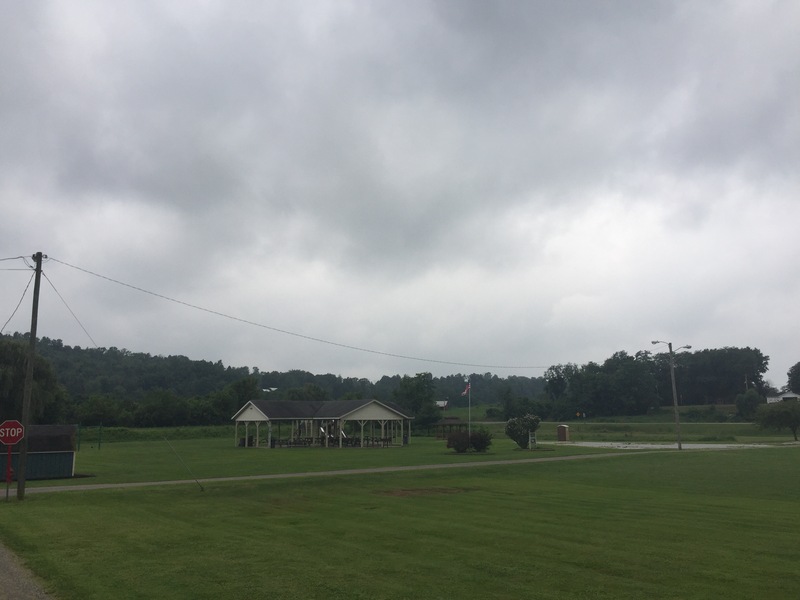 I am back in the east now–or at least the eastern Midwest–and am now again but confronting that solid gray sky that can drop water on you for hours at a time. I really hate rain. Let me say that once more–I really hate rain. There is almost no other weather I like less. When I was up in Virginia I took the cold there (20 degrees of so in the winter) as a challenge. I layered up and built up a pretty good cold weather kit. Merino wool underlayers, breathable outer layers, insulating shoe covers, lobster mittens, even ski goggles (these were indeed very silly looking but made a huge difference in facing the wind). You see, riding creates wind according to the speed at which one rides–that makes a standing 20 degrees considerably colder while riding. On top of that, I rode a lot after dark–in the coldest parts of the day. But gear was my friend and I faced the cold bravely. But rain is a totally different enemy. There really is nothing one can do to confront it other than find a picnic awning and wait. If I wear my rain coat, then I will get soaked from the inside out. If I don’t wear it I will get wet and cold from the outside in. 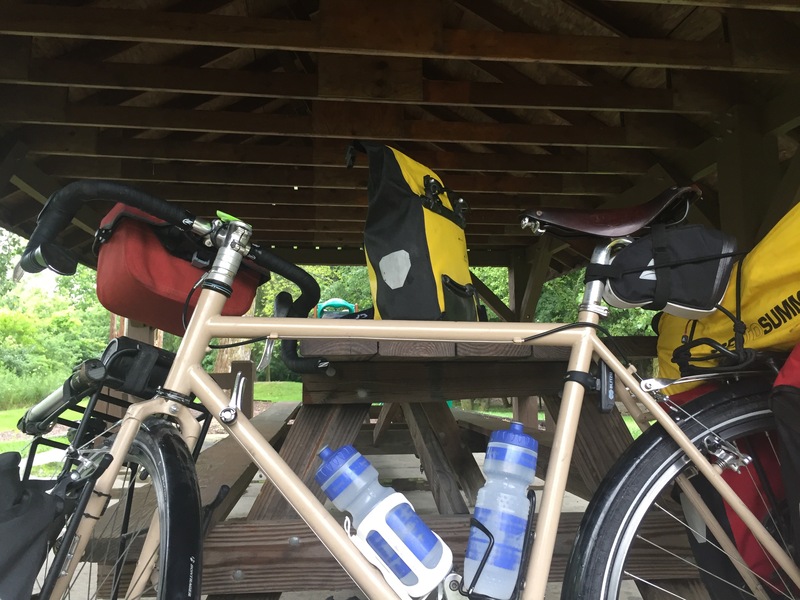 I am not too worried about my gear–I feel pretty confident about the waterproof quality of my Ortlieb panniers and handle bar bag. But I am a rain wimp and so the wetness and the drippyness just makes me miserable. So, hello wooden able, concrete floor, and roof–you are my humble shelter while the mean clouds do their worst. The last few days have been devoted more to visiting than to riding. Xander and I finished the Chicago leg of the trip a few days ago and we rode right up to his family’s door. The ride there was 50/50. We had a very pleasant night under canvas in Morris Illinois and then shot north. More of the corn-lined Illinois roads as we made out way to Oswego. The repetition of the Upstate New York Iroquois names all over the place gives me a constant double take. Oswego though was very close to the start of the Fox River trail–a riverside paved bike path that would take us up to the roads that would lead to Xander’s home. We soon set off on the trail and it was very nice–very much like the Mount Vernon Trail and was full of little ups and downs and tight turns, The main thing I noticed though was that the river was fast moving and high. The next thing I noticed was the police baracade and the sign saying “Trail Flooded.” Of course we ignored the sign and pushed on. In this case all we really had to do was walk or ride through some sodden grass and we were fine. The next time we saw one of these signs though, the result was not so happy. The whole basin before was part of the Fox River and there was no way around. In retrospect, the best idea would have been to wade through, get wet, and carry on with the dry part of the trail. Instead though, we turned to google maps and its bicycle route feature. We have used this quite a bit and to good effect. Xander set his phone so that Google would interrupt his music and tell him when a turn was coming up–we called this “the voices in his head” and more than a few times refered to knowing where we were going thanks to the voices in Xander’s head. Reaction to this were mixed when we told others of out unique navigation strategy. Once we had decided to leave the logical bike friendly (though submerged) trail, Google got pissy. “The Fox River Trail is the way to go” the voices told us. “Yes but it is now a maritime trail–a kayak run” we said. “Ok” said Google. “I will make a new route for you, but you won’t like it.” The voices were right. We did not like it. To save time, I will now list the kinds of surfaces our route did not take us over. Molten lava, salt flats, sand dunes, mounded human corpses, permafrost. Everything else though we pretty much had to deal with. Honestly–you have no idea how much the automobile has shaped and distorted our landscape until you try to get somewhere without one. Roads without shoulders, crappy glass and poop strewn paths, high speed corners, and more. These were all roads I would never touch if I did not have to. And everytime we appealed to the Voices all they could say was “sorry, I told you to go on the Fox River Trail, but no, YOU had to leave it! YOU had to be creative. Now YOU have to deal with it.” In the end though we made it to Xander’s house in fair shape and his pleased family got to see exactly the kind of sun tan one gets on a recumant. What followed was a very sweet welcome home to the prodigal son and his grizzled companion, and it was wonderful to meet his immediate and extended family. They were all very grateful that I had riden up with him, but in truth, he was more than capable of being on his own. But at the same time, I fully understand where they were coming from parentally speaking, and their collective warmth and welcome were touching in the extreme. Thank you all. Soon though I was off and in Indiana to spend Saturday with another grad school friend, this time in Muncie, Indiana. Again–more time spent with great folks to whom I am immensely grateful. Stacy prepared fresh vegetables from the local farmers’ market and Dan and I spent a considerable amount of time in the company of Martin Landau, who displayed a remarklable ability to be miscast. So morning saw me head out to the Cardinal Greenway Rail Trail taking me about 40 miles down to Richmond Indiana. Cardinal is a great trail–paved, straight, level, and with good amenities. I started writing this under a shelter, but I finish it in a Starbucks in Richmond getting ready to cross into Ohio. It rained most of the ride. I progressed this way. Ignore it. Put down my cap’s brim to keep the rain out of my eyes. Stop–put on my rain coat since my arms are cold. I can feel my socks getting wet. Stop again–try to pull my rain coat hood over my helmet. Feel the puddles in my shoes. Just keep riding. That really is almost always the answer–just keep riding, I am listening to George Orwell’s Down and Out in Paris and London. It is great stuff and what he describes is far more depressing that riding in the rain. The antisemitism is a bit thick and it is bad to tell if Orwell is just relating it or endorsing it. 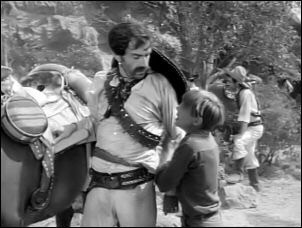 Oh well, at least this Jew is not having to swindle a Russian waiter or trying to sell his daughter into prostitution–nor will he have to portray a Mexican bandito or German elephant trainer turned villian. Rain seems a small problem by comparison. One of Orwell’s friends though did complain about an American hotel guest who did not want full French meals and instead asked only for Grape Nuts, scrambled eggs, and hot coacoa in his room. Ummm…. I had to rack my brain to recall if I had visited Paris in the interwar years. I am pretty sure it was not me. Man Plans, God Laughs Tour, 2017. Morris, Illinois. 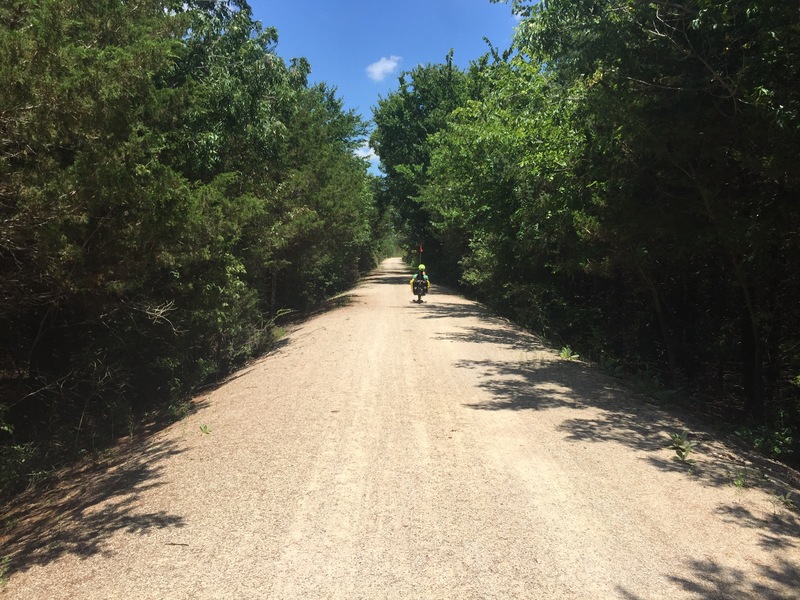 Riding the ACA Route 66 Trail and Google Map suggestions. ​Another feature has been roads that are sprayed with tar and then graveled. In time this makes a rough but solid macadam, but when new, the way is sticky and slow, I spent many miles listening to my tires popping tar bubbles as I rolled over them. Much of Illinois looks quite a bit like western Kansas in that it is flat and farm-filled. But there is more housing here and it was of a more familiar eastern suburban/rural nature. I saw very little that caught my eye or looked old. Instead, there were lots of ranch houses with those well-mowed lawns and that big tree whose base is surrounded by plants. But the fields really were endless. Part of our path to Chicago has us riding the old Route 66 run. I am at a total loss as to why there is some sentimental connection to this highway. Yes, there was song, and yes, it is now a sort of self-perpetuating nostalgia long detached from its original causes, but apart from that I am lost. I guess it mattered that it once was the main road between Chicago and LA, and as such it was the ribbon which bound up many a midwestern family vacation. And no doubt many a Hollywood culture maker had it as part of their psyche and so it became part of ours–sort of in the way the economy of the Planet Televison seems to rely disproportionally on the business of comedy and comedy writing. Oddly, no one can really explain to me why Route 66 should be so important. 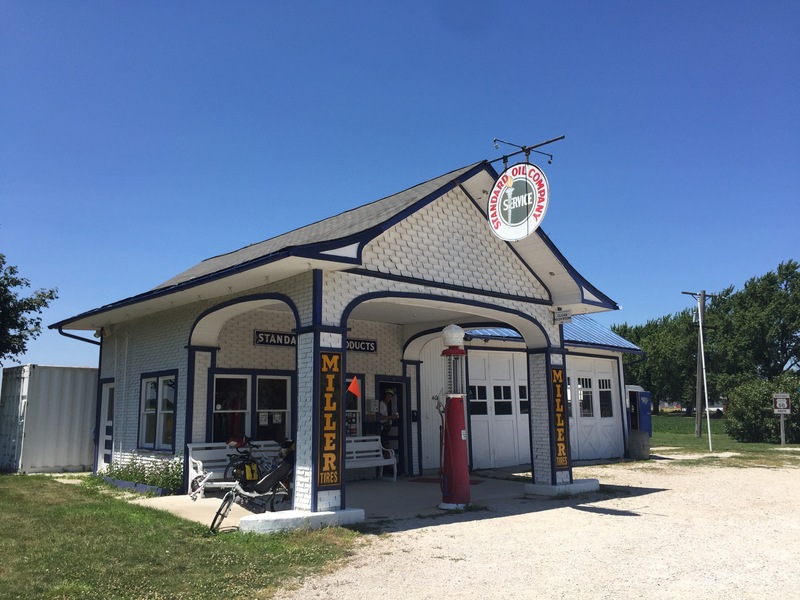 I missed my chance to go to the Route 66 museum in Pontiac–they might have explained it. The woman at the restored Historoic Gas Station in Ordell could not answer my question either. She confirmed though something I knew–that Europeans were more connected to the Route 66 idea than were Americans. For them, Route 66 connects to some romanticized Americanism whereas for us it is, umm, maybe a fantasy memory of the 50s? I dunno. How many people are left anyway with that Happy Days vision in place? It seems pretty clear to me that as a set of historical sites, Route 66 is fighting an uphill battle to stay relevant. Only a few sections still survive and here and there remain some kitschy motels and trinket shops, but since no one really travels there this way anymore there are no new memories being made. In a generation all of this will be even more mysterious. The whole thing seems linked to that confusing and ultimately unhealthy love of the automobile I saw in elderly riding gangs in Nevada. The romance of Route 66 then becomes something akin to an old racist song or those horrible 50s comedians, who, drink in hand, told jokes about or imitated drunk people: it might have been innocent enough in its day, but it is impossible for us to put the blinders back on and see through those eyes ever again. With that said, anything that leads to the preservation of an old and easily overlook vernacular building is a good thing. 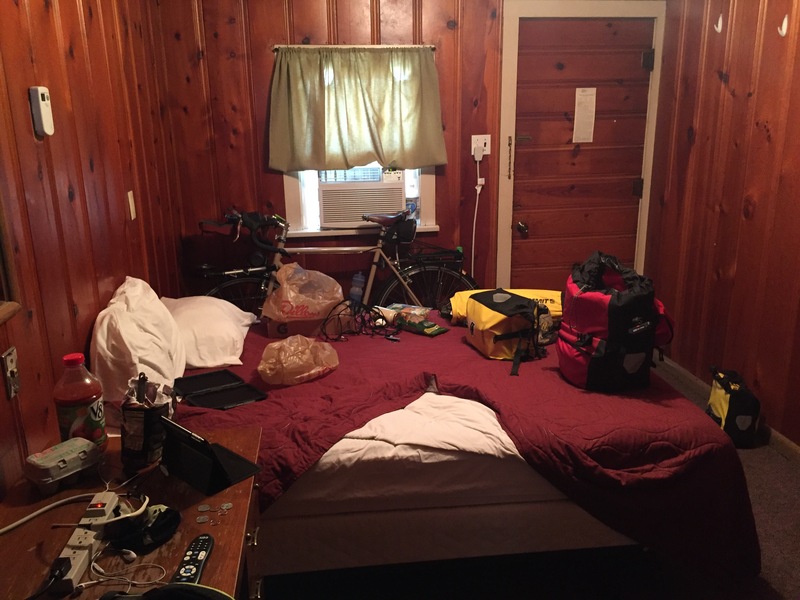 So, keep the motels and the gas stations say I–but let’s visit them by bicycle. We can pop tar bubble along the way and corn corn corn corn corn corn corn. Man Plans, God Laughs Tour, 2017. St Louis. So here we are in St Louis, or “San loo-EE” as the locals call it, if they spoke French, and if they felt like it. We have spent the Saturday Zero Mile ritual with Robert “Buddy” Paulette (et famille), an old friend from grad school, a Rich Neck Alumnus, and as Sarah claims, one of the two or three funniest commentors on my Facebook feed–high praise given the level of the completion and the standards of the judge. She is right through–Buddy’s quick wit has given us all some true gems over the years. 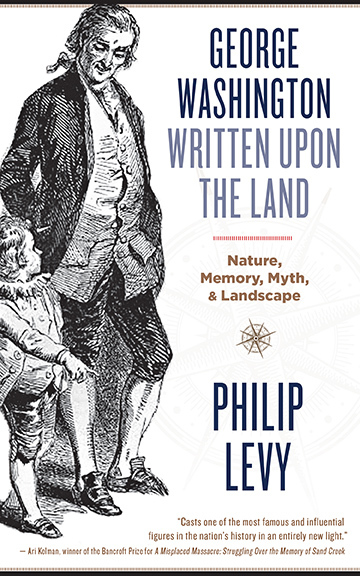 Buddy also is an accomplished scholar with a dynamic research agenda and some upcoming support from one of my favorite George Washington inflected institutions–ahem…. 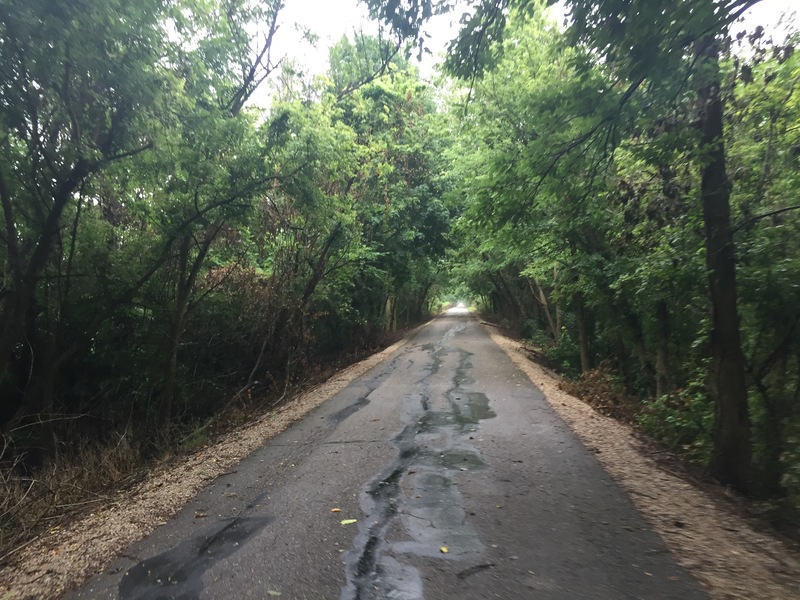 To get here, Xander and I finished off the Katy Trail in three days–two of them long ones. We hit the edge of some weather on the last day, but any delays were more due to my perennial quasi-rational fear of rain. All but one of my crashes have been rain-related and I am scarred. Again, Xander kindly indulged my hesitance once I felt a rain drop and saw a puddle, but in the end we still made 108 miles and slept in a nice Warm Showers home when done. We miscounted miles though and made the last 10 miles in the dark. The Katy is sort of hypnotizing already but under cover of darkness it is positively meditative. The next day was the ride into central San loo-EE–an urban ride with some fun hills and traffic dodging. Jews too! We passed a cemetery and a small party starting a burial. I stopped and hung at the back of the group to offer amens and wish the woman’s neshama an aliah in heaven. Having had to miss Gordon’s funeral, I was glad of the chance to pay some small set of respects here. The next Jew stop was a deli with a big blue and white star in the window. This was the first Jewish business I had seen in ages and in could not let it pass. Death and food–it sounds like a Woody Allen movie. Once in town, we found our way to Big Shark–the bike store which everyone directed us to. 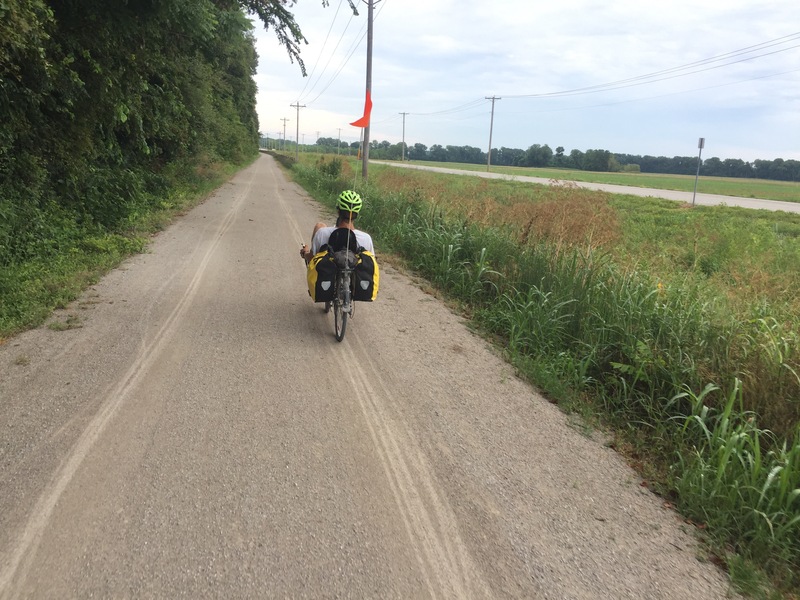 Xander needed a new tire and a small esoteric recumbent part problem addressed. Luck on the former and failure on the later. Recumbents are tricky beast and eventually Xander had to find a specializing shop and even they lacked the part but had a work around. While at Big Shark though, I also took the chance to replace my shoes–three tours seems to be the limit for a pair and my bad habit of unclipping heel inward have left a mark. But that is in the past–I now have a new pair of tourable shoes. Now I need to learn to clip outward. After Big Shark, we rode a few more streets and we were in the Shaw neighborhood where Buddy and Bridget raise their son Mack in a really nicely redone home in a neck of town filled with other great looking homes. It was then that Xander faced his biggest test thus far–even though unsuspecting callow youth that he is, he had no idea what lay in store. The question was can he survive a day in the company of two historians. That is no small challenge and one that has withered many weaker souls. All signs though point to Xander having made it through with only an acceptable level of recontextualization. Looking back from the banks of the Mighty Mrs. Ip, The Katy Trail itself is something of a blur to me. It was largely a species of green tunnel as I had expected and although there some trulylovely parts, a lot of it is just passing trees and a sandy white path. It was level level level and an easy ride– a great trail and a particularly good one for new cycle tourists. Camping was a bit unclear–so one area for improvement might be campsites along the way. The towns are a mixed bag and they get nicer and nicer as one moves east. And by nicer I mean they start to look more like Virginia towns–really, there were a few that were indistinguishable from Virginia counterparts. In one we talked with a local business owner who explained that the residents worked very hard to maintain the genuine charm of the town. Some of that included keeping out more “probelematic people”–an assessment around which she danced very carefully. I took her meaning though, and given the post-industrial meth and pitbull devastation we saw westward. She said they fought off a Missouri River tourist fish camp plan for the shoreline fearing that they would have no way to move people along when the fishes stopped biting. 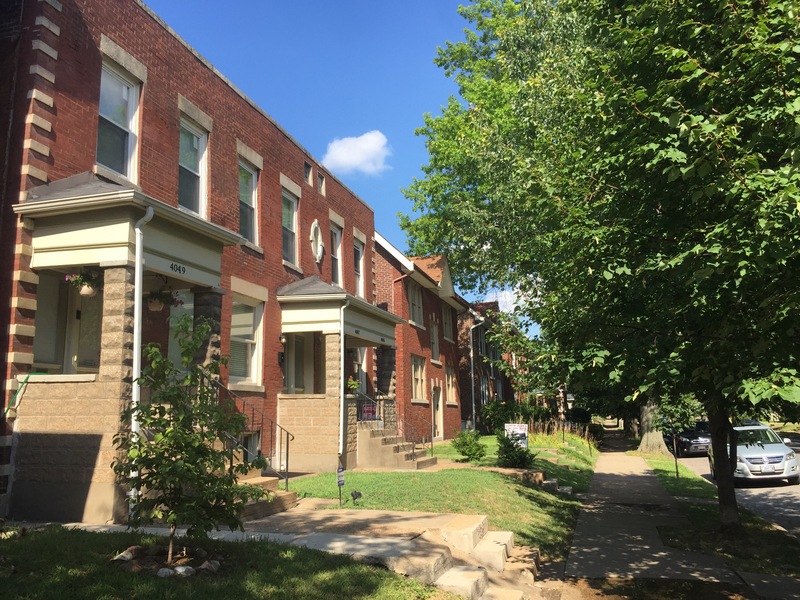 The issue as she presented it was the balance between possible income sources weighed against fears to maintain property values. Stranger danger vs stranger resources. Many towns with trails face this and there are many responses. I am not sure though this is the best one. Trails represent real sources of income and energy and the Katy in particular has some real state money behind it. Each trail head has a similarly designed information station and bathroom set–though not all have water. One level understands the value of these trails but as we saw in Cute Name Left Omitted Town, Missouri, there is still a strong fear of strangers–a fear strong enough to turn away their money. The irony of course is that each and every town along the Katy was a rail town, and as such its livelihood was dependent on the movement of goods and people up and down those now removed tracks. 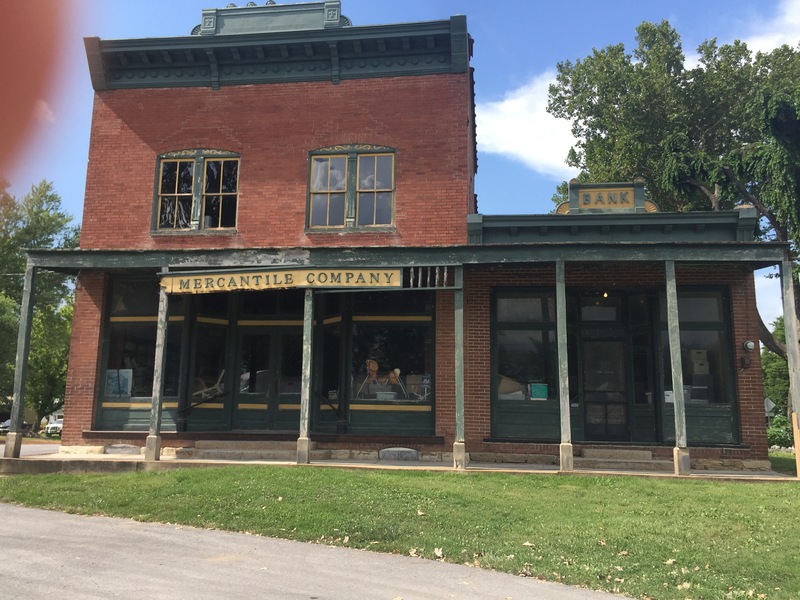 The original residents were themselves mostly strangers who relocated to be near the rails and in some cases the shells of their businesses are still there to be seen as well as ghost signs on the brick and the carved names of long-gone entrepreneurs. It is a bit late to go all xenophobic now–or at least it represents a curious case of amnesia. We paused for a quick swim in the Missouri to break the heat on our long day–making the day longer, but well worth it. The current was very strong and a big whirlpool carried a log around and around so that it looked like a sort of Loch Ness monster or renegade Twainian raft. The river is wide and the banks muddy and wild looking–nothing like an eastern river. The Corps of Discovery passed this way in the spring of 1804 and I don’t think the river looked all that different. These men were strangers then too–and bearing wallets in their own way. The locals were of mixed minds about the strangers then too. Some saw advantage, others saw trouble. Both views were right then, and I guess both views are still right today. The more things change…. So many miles. 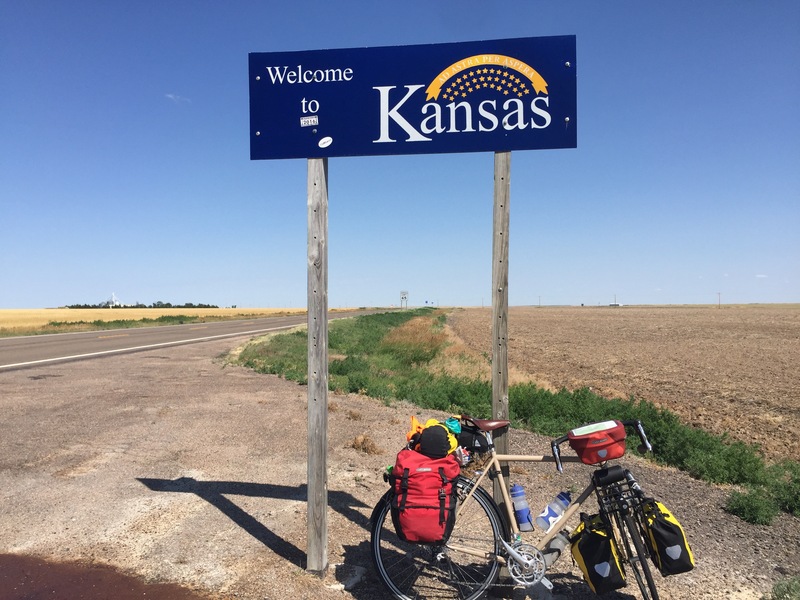 Kansas is over now–not for the people who live there–no worries, they are all fine. But for me, it is now a memory. Kansas was the place I knew least about when I planned this adventure, and so it was the place I was most curious about. It has not disappointed. The landscape was so much more varied than I might have imagined. The people too have been wonderful–with of course one notable exception in a white minivan. 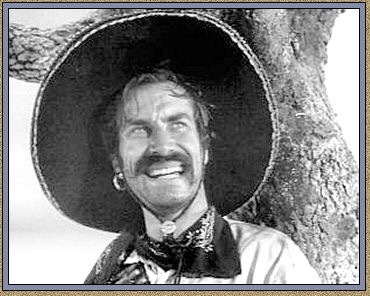 But now that that I am a border ruffian and have fled the state, it seems a good moment to reflect. First some background though. I had said that I did not need to have a real plan until I got to eastern Kansas. Until then I was free to imagine continuing on the ACA Trans Am to Yorktown, or turn right and head down to Florida on some mix of roads. 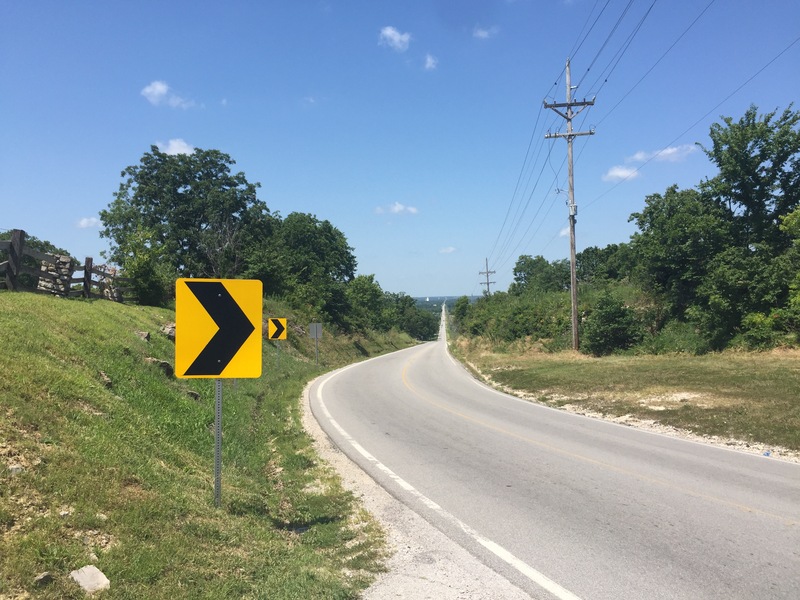 There also was the possibility of heading north to ride the Katy Trail across Missouri and then cobble something together to get to Pittsburgh and then sleepwalk down the GAP and C&O to DC–old home week. Well, as it happens the Dago gang ran into some trouble, and I arranged to meet up with Xander in Newton and then head up to Chicago with him. That is the plan, and we met at Newton where he cooled his heels waiting for Captian Slow. Xander took up a berth with a wonderful Warm Showers family in the most amazing Victorian mansion-ette! I wish Rami had seen it–it would now be his most favorite home on earth. My slow progress afforded Xander time to learn the town, settle in, find a job, marry a nice local girl, run for office–the lot. I am not sure he really pursued all those possibilities. 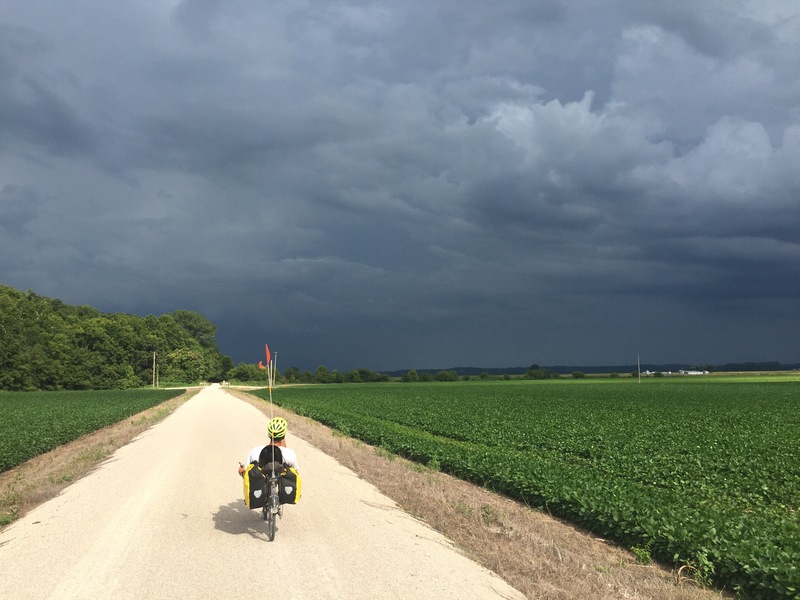 At any rate, we set off a few days back to finish off Kansas and hit the Katy Trail–the 260 mile rail trail that cuts across Missouri avoiding both cars and Ozark hills. The Katy is not on the ACA route, but many many people do the detour north to make use of the land’s longest bike path. 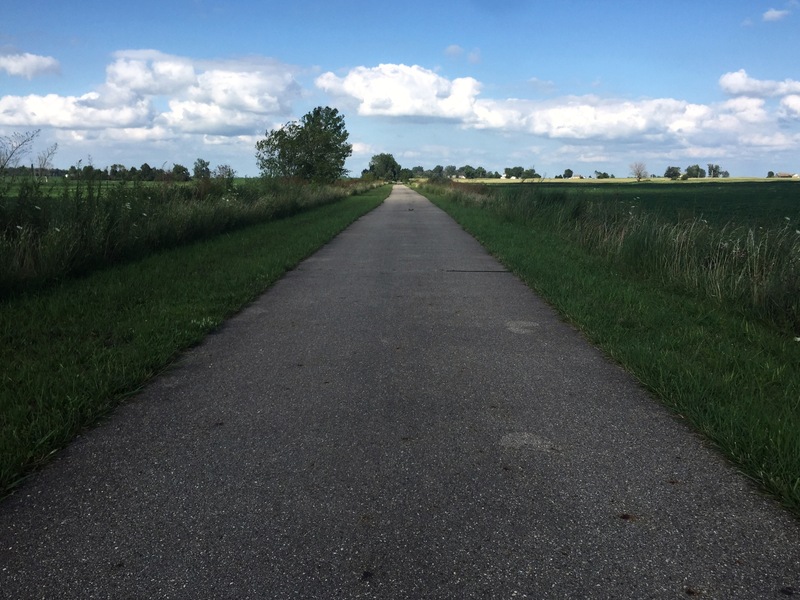 We worked out a route to the trail head in Clinton that took us along a small rail trail called the Prairie Spirit Trail on our way–a sort of narrower practice run for the Katy. We only needed it for about 30 miles, but it made a great break from road shoulders. So, here I am in Missouri, on my way to Chicago and ready to write things about Kanasas. First off, the land was very diverse. The western end was part of that vast plain that stretches out to the Rockies. But east and more east and it gradually became a more familiar farmscape. At one point there suddenly were lots of German names and we entered a Mennonite hot spot. 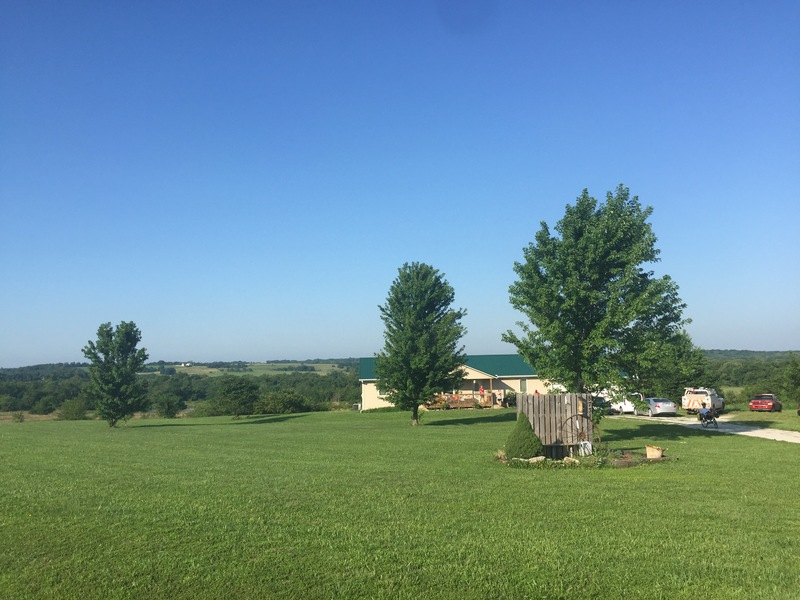 It has been my experience that Mennonite-rooted communities are very friendly places, and indeed that was true in Kansas as well. The odd thing was that 70 miles farther east it was suddenly cowboys again–and not just cowboys, but cowboys in leather chaps and big spurs. In my order of the world, Cowboys were west of Mennonites–not EAST of them! The rules matter! Kansas was flat, but there always were rises and drops. As we got farther and farther east, the rises became more pronounced. Right at the border is became downright hilly. In fact, we rode through some very long climbs and crossed a ridge that would have been at home in Nevada. The reward was riding through the spine of the last surviving bit of tall grass prarie. We had one very hot afternoon in that prarie when we needed water. The town had no stores and we saw no pumps. There was a high school though, and someone had obliegingly blocked a door open with a bit of two-by-four. That was essentially an invitation, and in we went to fill bottles. That led to sitting down and that in turn led to nap time. At some point one of the two-by-four-dependent workers needed water, and he came down our nap hall and more or less stepped right over us. If our presence was a problem that was the chance to call attention to it. They did not, thus it was not. 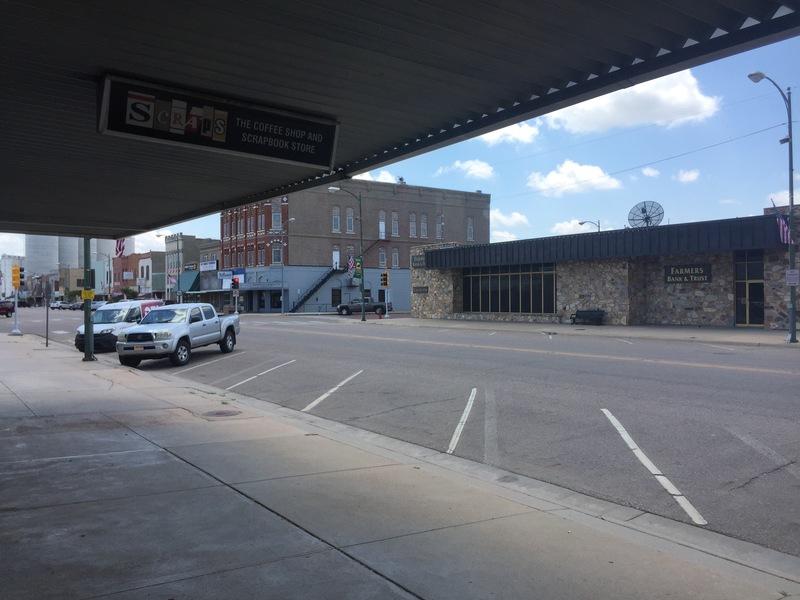 In the town of Buhler a nice fellow paid for my orange juice and blueberries and a local woman informed me that the recreation center let cyclists take showers for free. I was over there quickly and washed almost as quickly. That little break made what ended up being a 114 mile day a much happier affair. On our last night in Kansas we stayed with a wonderfully sweet family and had a lovely time chatting, joking, and cleaning bike chains. Kansas was a great. The Warm Showers network has been amazingly helpful. We met such wonderful, friendly, and welcoming people in Eureka, Parker, and in Eads, Co. It takes a special person to want to be a Warm Showers host. Some are cycling enthusiasts themselves and welcoming others is a good way to payback for revived kindnesses. I know that I stop for every hiker I see trudging along Rt 7 on their way to get groceries in Great Barrington–it just feels wrong to not stop. Janet and Orvin in Newton certainly have done time on their bikes, but they also have a wonderful capacity for caring for others. Robyn in Eurka is one of these as well–a sweet and caring person with a strong care-taker edge. 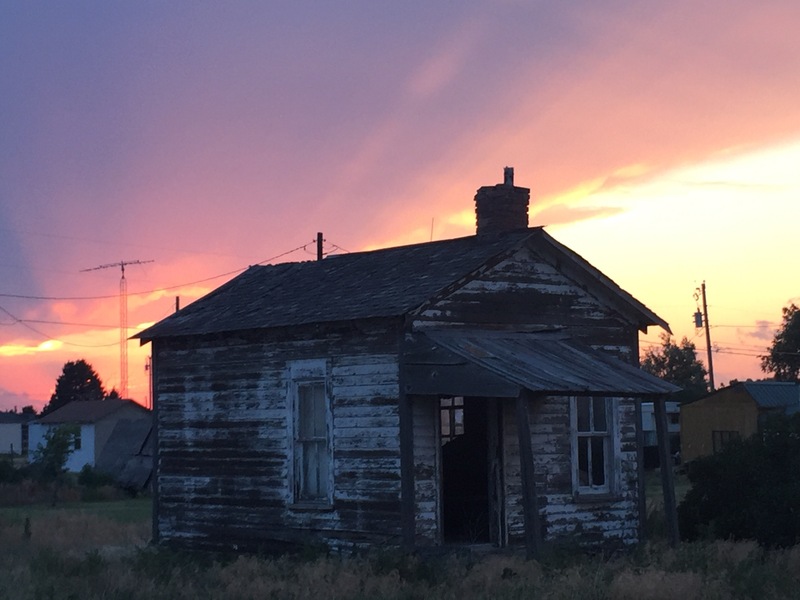 The Campbells in Parker were both cyclists and care givers–but in their case, the whole family was in on the game. They were a great source of information about the upcoming Katy Trail which they rode and knew well. All in all, travel like this is made managable by these sorts of trail angels. It is remarkable that so many people are willing to reach out and open their doors to sweaty road-dirty strangers. But then again, most of the people riding out here are, if not cut from exactly the same cloth, are at least trimmed and edged in similar fashion. Gillian in Eads said that when she opened her ranch to cyclists (in exchange for farm chores), her neighbors said she was crazy and that people would steal from her. She was suitably dismissive saying it was hard to imagine a cyclist trying to rides off with a television, or perhaps a goat. In fact, the only thing most cyclists are liable to steal is storage space for all the things they want to leave behind to lessen the load. On that score, I think I am finally done mailing back all the things I regret carting along–like my sleeping bag! Trail angels like these generous people are part of what makes this so great. We live with this constant lie that we are somehow autonomous entities–that we rise and fall on our own merit alone. The truth is that we all are part of some vast hive and our successes are usually a mix of divine favor, luck, timing, and the kindness and labor of others. People who think otherwise are just a bit blind. They need to get out on the roads on a bike more often. I got hit today. It was not severe and I was not hurt–I was just clipped by a white minivan’s rear review mirror. But I was very shaken up and really really angry. 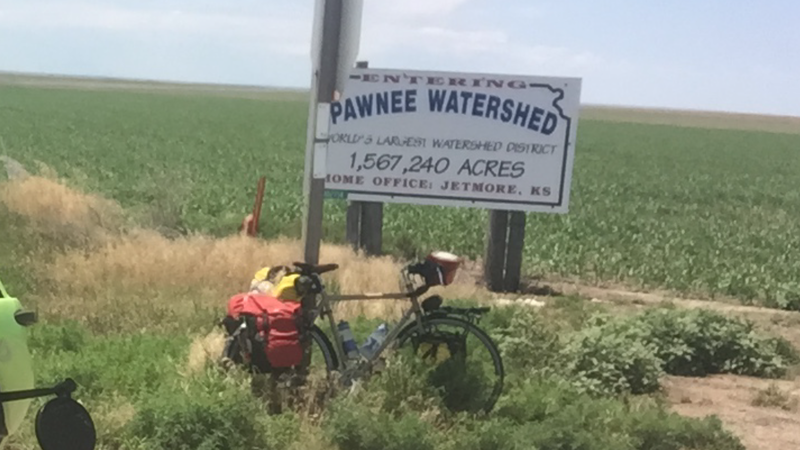 I was just a few miles outside of Larned at the start of what was going to be a long day. Instead, I had a very short and scary day that ended in Larned right where it began. I had not planned on staying in Larned at all. 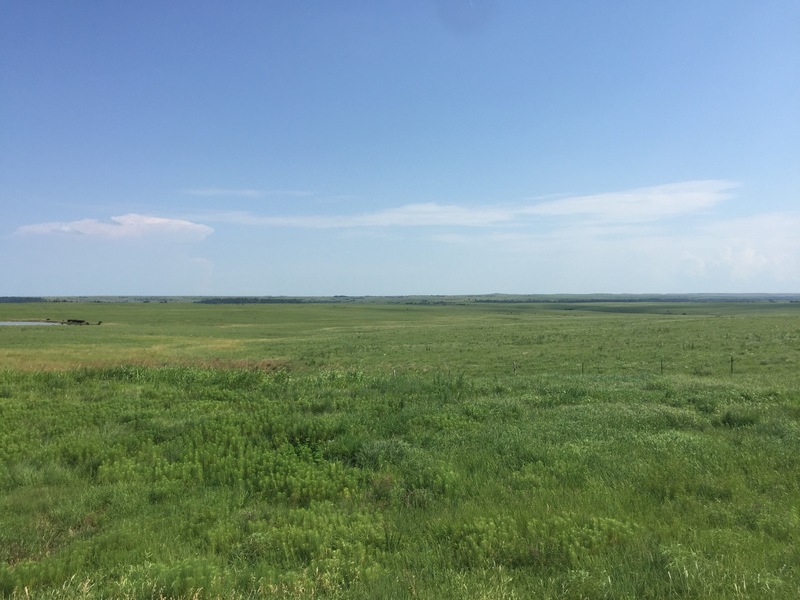 This stretch of Kansas has long patches of nothing. Towns that are really just crossroads and miles and miles without any kind of service. It is nothing as bad as the desert–there is water–but it is pretty solitary. 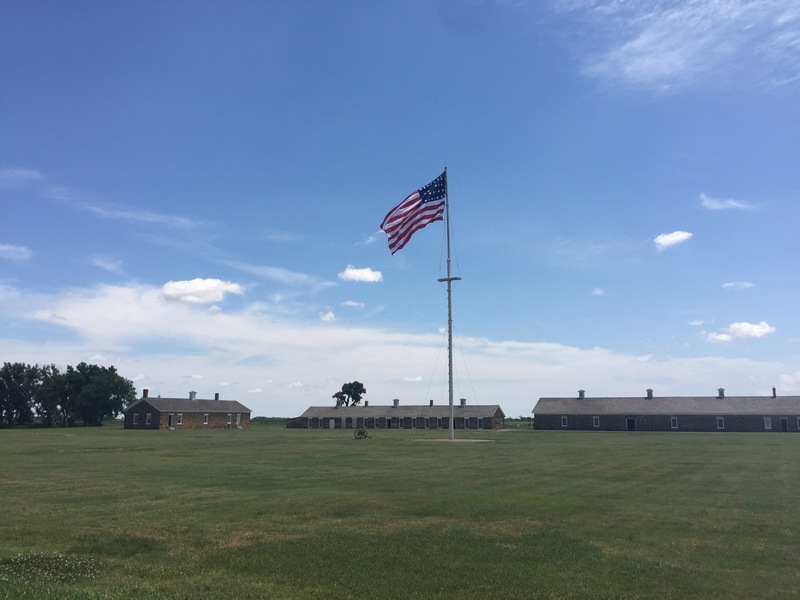 I had a great time riding up and over the Pawnee Watershed hills and later made a stop of at the NPS Fort Larned park, because, history. Storms the night before had disrupted my sleep, but even so it seemed warmed out. At 1:30 it turned out it was 104, so that explains the warm feeling. When I rode into Fort Larned I was pretty glad of the shade and cold water. When I rode into Larned proper about 7 miles later the allure of a town was too much to resist. Not that I have been really roughing it all that much. Kansas is dotted with good facilities every 60 miles or so. 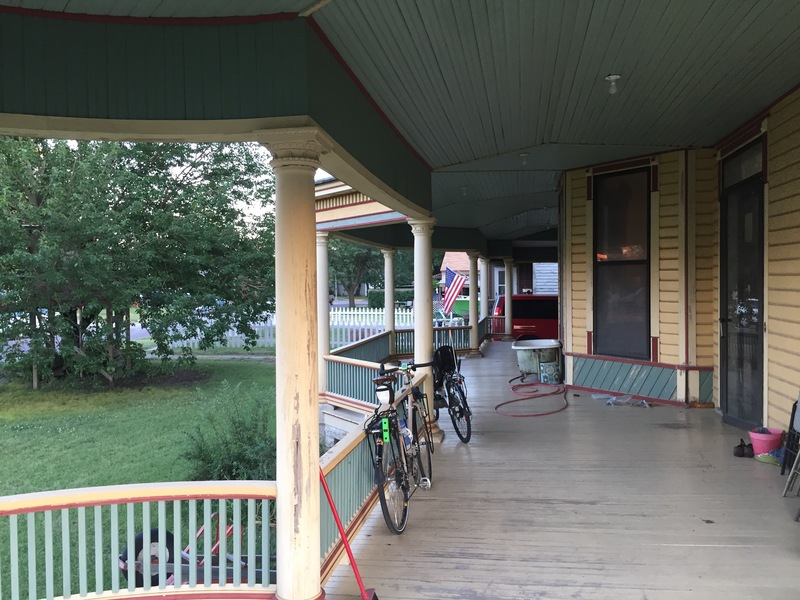 Over the past few night I stayed in the great gym in Scott City and camped out next to the old High School in Bazine thanks to the nice family that now own it, live in it, and welcome cyclists. But between these wonderful watering holes there is not much. It seems that most riders follow the same path and land on the same lily pads. When I got to Larned I learned of the afforbale motel right close by and I succumbed. Soon, I had grocery shopped, cooked, eaten, bathed, and was falling asleep by 9pm. Up by 5 or so today, granolaed, and back on the road soon thereafter. 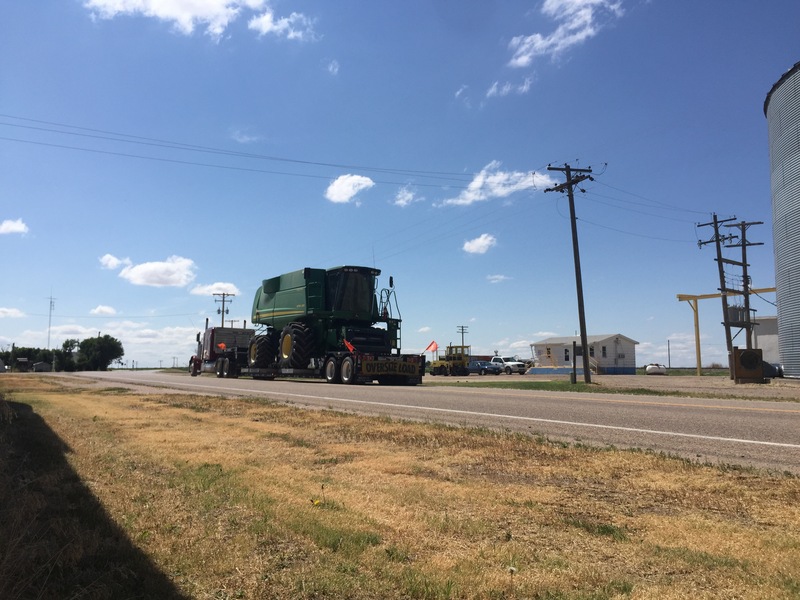 I went a few miles south of town stopped only by a small traffic jam caused by a loading grain train blocking the Main Street. South of town the route runs along Rt 19–a fairly narrow road graced, as it happens, with no shoulder. The white line more or less marks the edge of paving. The next thing I noticed was that the speed limits was 65–and that struck me as a bit fast even though the road is arrow straight. Right away a roadrunner ran across my path. I think I saw one once before in Arizona but not as close as this. Yesterday I saw a dead coyote by the side of the road, but I have little evidence to implicate this particular bird. The charm of RT 19 I think is that it is lightly trafficked, and indeed, I think only one or two cars passed me before the white minivan. His mirror hit me mid-arm and did not even knock me down. I saw the van speeding off hugging the white line. He made no effort to stop–even though the impact had slammed the mirror back on the door. The road was empty so the minivan had all the room in the world to avoid me. I sceamed and fumed to no avail. I tried to flag down the next car, although I am not sure just why–I think I was just panicked a bit. At any rate, the car just pulled into the oncoming lane and ignored me. Some people are awful. I collected my wits for a bit and made sure I was not actually hurt. 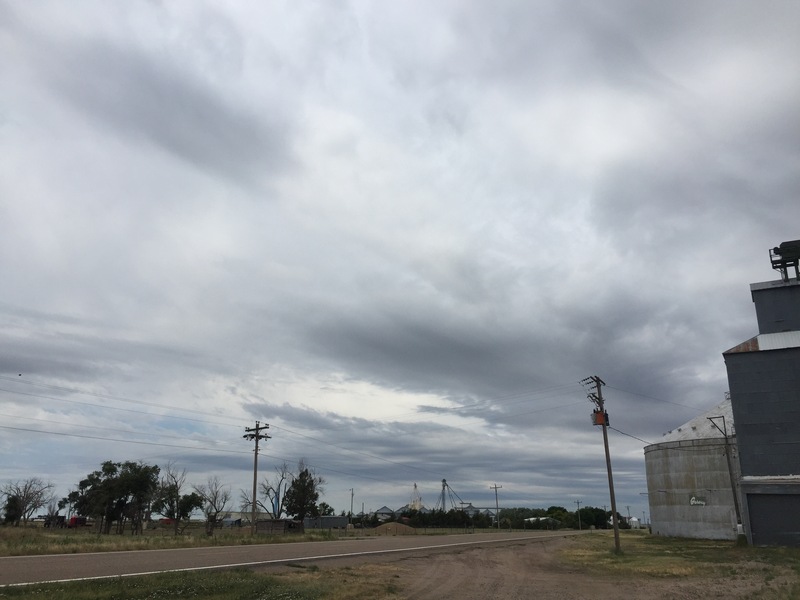 I was facing about 50 miles of nothing eastward, and so I thought it best to head back to Larned in case there was a real problem. Only on my way back did it dawn on me to call the police–hit and run is still a crime. Of course I was probably too late for the sheriffs to have found the van. Nevertheless, once the cars had made it past the train, the sheriffs past me rushing down Rt 19. One doubled back and check in. Deputy Perez suggested I see the EMS team. At first I did not think it was called for, but as we talked I decided to let him call them. Sometimes adreneline can cover pain and I did not want to trust my judgement. The EMS guys did not see anything worrying, and soon Deputy Perez gave me a lift back to the motel–Room three left just as I left it. I filled out some report forms and went back to sleep to silence the anxiety. Larned was not in my plans, but I was clearly parts of it’s. I found the local coffeeshop/scrapbook suppply store/tuxedo rental and here I sit watching the cattle trucks and the grain trucks pass by. Burgers and buns, burgers and buns–albeit in their most unprocesed state. 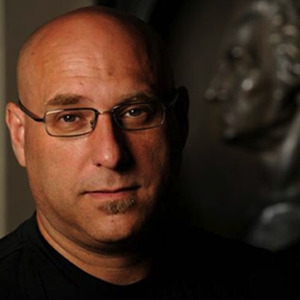 Things here are oddly expensive–and 16 dollars seemed a lot to pay for head shearing–maybe for a full shave–but not just the machine. A store here advertises used c-pap “so clean machines” but most of the store fronts are empty. The streets are largely paved in brick, which is charming, but a bit rattley. I will leave tomorrow at dawn though–“so clean” after a bath tonight. In 1700 through, this place was a paradise. The land sits between the Pawnee and the Arkansas Rivers meaning endless water. The soil is fertile–hence all the trucks carting proto-burger buns, and in the old days, the burgers themselves roved in large herds on the plains beyond the rivers. It was easy to get your meat and three veg, and quaff a stiff drink of Colorado snow melt. They tell me that a few miles from here there are surviving ruts from the Santa Fe Trail which ran right through here. But for the Pawnees, Cheyennes, and Arapahoes, each wagon on the trail was a speeding white minivan, swatting everything it could with its massive rearview mirrors. I got off easy. Man Plans, God Laughs Tour, 2017. Ordway Co. to Tribune Ks. Riding the ACA Trans America Bicycle Route. Wind. That is the defining thing out here. It colors every action and defines every moment. There are short gusts, sudden blasts, curling sweeps, hot waves, and cooling zephyrs. Most of all though, there is a constant barrage of headwind pressing against a rider’s desire to go forward. This Mid-western Mistral never really stops–it just presses and presses. It is my constant irritating companion and the sound of its demanding hiss for attention never leaves my sad ears. Sometimes I imagine it as small horse jockey. He is wearing a grarish livery of purple and yellow checks and has his two-toned horsey helmet strapped on tight. He has his little hands clamped hard onto the flats of my handlebars, and he is leaning in towards me, pushing me back with all of his might. His feet are flat to on the ground and as I ride forward despite his pushing, the heels of his riding boots scrap backwards along the pavement leaving little scratch marks and trails of gravel. All day long he stares angrily up at me. Oh, and he is screaming at me too. Sometimes I take a break for a drink or just to enjoy the shade. But when I come back to the bike, the jockey has rearranged himself. For the next few miles, he is going to lay flat on his stomach behind the bike and grasp my rear rack and make me pull him along. I don’t think he minds much how he does it–as long as he is slowing me down. 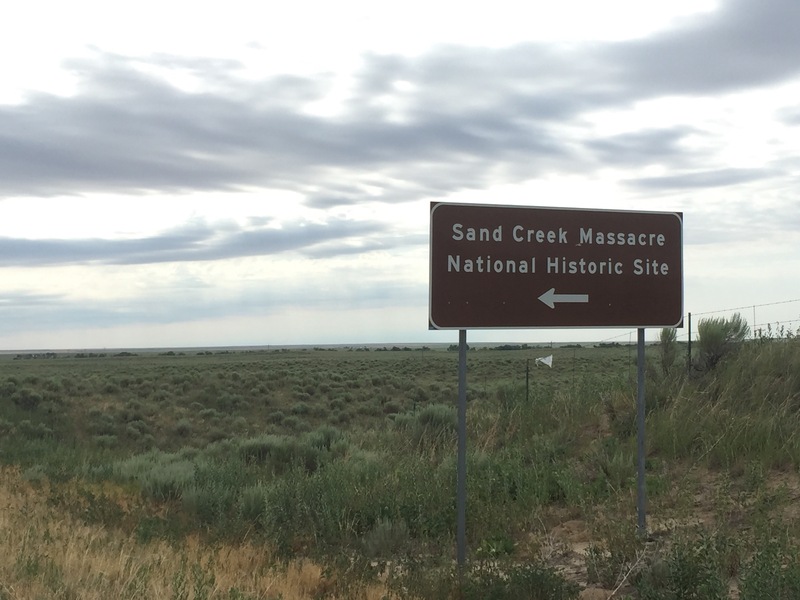 At one bend in the road, near a non-place delightfully named Chivington for the man who oversaw the attrocities committed in 1864 at Sand Creek a few miles to the north, I managed to give the jockey the slip. The road reoriented, and for a moment the Jockey was off his post. He was still there, screaming at me the whole time, but for a mile or so he was sort of hanging onto the left end of my handlebar. Suddenly, my speed jumped up. In no time I was overpedaling and had to shift up three or four gears. The ground was flat but my speed increased even as I felt my effort actually lessen. From the usual 11mph (my depressing Spinal Tap joke–this only goes to 11) I sailed to 13, then 15, then 17mph. The Jockey was still there and screaming, but he was less intense and I could see he was having a hard time giving me a hard time. But then the road turned again, he found his footing once more, we resumed the position of our all-day battle. The trucks have a role to play in this too. It is harvest time in this part of Color-ansas, and huge vehicles are shooting to and fro. The horizon is often dotted with lines of giant combine machines strolling along looking like backward mechanical brontosauruses. I see their drivers at every convenience store I stop at–dusty young men in baseball caps mostly, who seem to be in endless good cheer razzing one another and eating snacks. 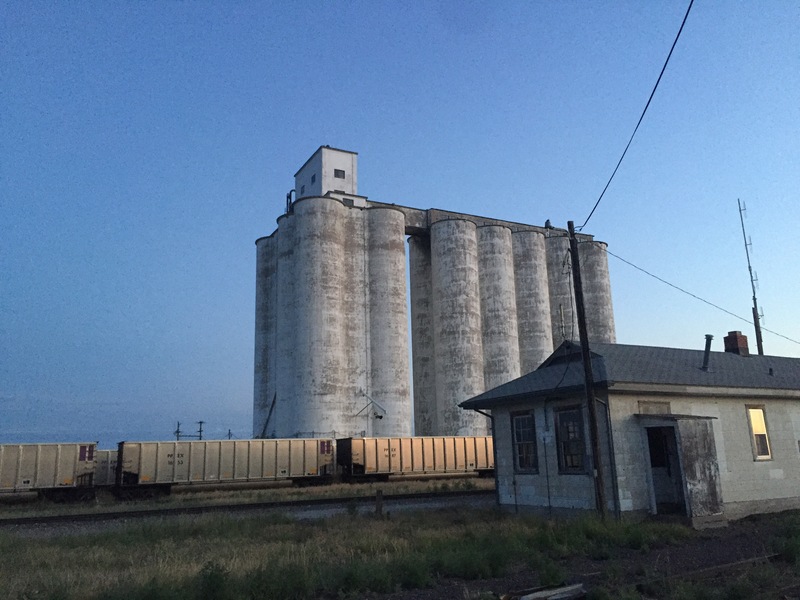 Some trucks carry the grain hither and thither to the silos that are the only buildings breaking the horizon. 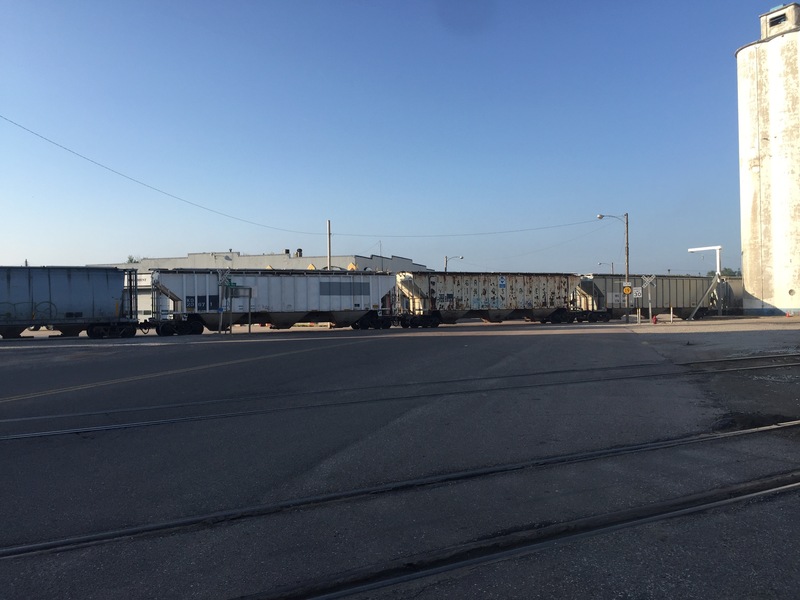 In Colorado, they also mark towns–but in Kansas they are more frequent and often just sit along rail lines. Other trucks though carry huge farm machines between fields. These are simply enourmous 18 wheelers plus a second trailer bearing 6 more, and are heralded and followed by warning SUVs. The machines have to move between fields because their owners’ livings depend not on the owning of land, but on the operating the machines to harvest it. Teams of harvesters move between towns and fields as needed as well, sometimes staying a day, other times a week or more. My hostel in Tribune is now home to two teams who are in the fields all day and just go to sleep at night. One of their number though seems to be on his own. He just sorts of haunts common room watching Shrek, or sits glumly outside watching the horizon while his fellows work. He has a new cast on his forearm–a clue perhaps to his seemingly unwanted leisure. But there is no leisure when the trucks speed by on the road. Their effect differs depending on which way they are headed. The ones coming towards me are the worst. Their arrival is preceded by a momentary silence and then, all of a sudden, the Jockey has five or six friends with him. For a second or two, they are all over me. One jockey wearing black and white stripes is pulling my bike to the right while another all in orange satin, is doing all he can to pull me leftward. The two tug and sway and the bike feels all skittish and unstable. I have to remember each time a truck is coming to get low in the drops and brace for the Jockeys. Meanwhile one dressed in a red top with light blue jodhpurs jumps onto my shoulders and grabs my helmet jerking my head side to side–he kicks my chest with his feet. One time, a jockey in a yellow and green kit tried to grab at any loose items I had on my racks and throw them into the grass, all the while kicking at my panniers. But, blessing of blessings, once the truck passes and the attendant SUV zips by with its dopler-shifted “f*** Youuuuuuuuuuuuuu” trailing in the distance behind me, the new Jockeys all vanish just as fast as they showed up, and I am left alone with my usual friend screaming at me as always. It is slightly different when a truck comes up from behind me. These of course, present more danger to me than do the ones in the oncoming lane. They are closer–and that is scary enough–but they also once in a while pick up some road refuse and throw it at me. One rock hit me smack in the middle of my back and I had to stop for a moment to recover. If I am going to be hit, it will be by a driver trying to get to the same town as I am. But, my deadly friends have an odd effect on the Jockey. I have two mirrors so I generally know when things are coming up–larger than they may appear in the reflection. The first thing that happens when a truck gets close is that my Jockey lets go for a moment. On top of that, there is a hot wind that pushes from behind and for a second it is as if everything is lighter than air–no jockey, no loaded bike, just a pushing hot blast. The local drivers know there will be cyclists on the road and they are all adept and thoughtful in giving us plenty of room. Most occupy the oncoming lane as they fly by. This much appreciated consideration has an effect beyond putting safe distance between us. As the truck passes and the Jockey is for the moment disoriented, there is a moment when the full size of the vehicle actually blocks the wind entirely and it is as if I am drafting the truck. The Jockey is, for a second, gone. It is a welcome respite and almost makes up for the mortal terror of having to share the road with these beasts. But, it is a tiny a respite, and as soon as the truck farts its way away, the Jockey is back. He slaps me in the face for thinking that there may be some possibility of a life without him. How dare I dream, how dare I hope. 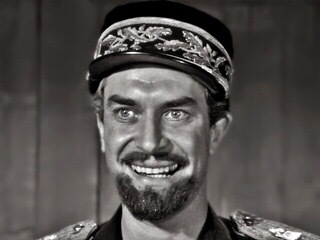 “I am the Gulag and you are Ivan Denisovich, I am Alcatraz and you are my Birdman, I am French Guyana and you are Dreyfus!” he screams at me as he settles his little gloved hands back onto my bars, and the ride continues as before. You can laugh now, you screaming harpie–but I will win. I will wake up earlier and earlier each day to ride as many miles I can while the Jockeys still snooze and take medication for their sore throats. If 5:30 am is not early enough, then tommorow I will try 4:30 am–whatever it takes to find the times when you are slacking. And as I get lower in altitude and deeper into Kansas, stable heat and greater humidity will sap your energy. Each mile I ride takes me a little bit closer to the place where your grip will finally fail you, and you will slip, and my wheels will roll right over you. I will back up and roll over you a second and a third time for good measure. And you too trucks. I know your routines now and can avoid the hours when you are most eager to get home. The harvest can’t go on forever. As long as I can make miles, I am winning.